…and by “beat,” I mean survive. I think it’s safe to say that TSA airport security checkpoints are the most stressful part of air travel. However, a lot can be done to streamline the process if you know what you’re doing. This is my routine, which almost never causes me to slow the line. If you’re not slowing the line, then you’re not stressing out. 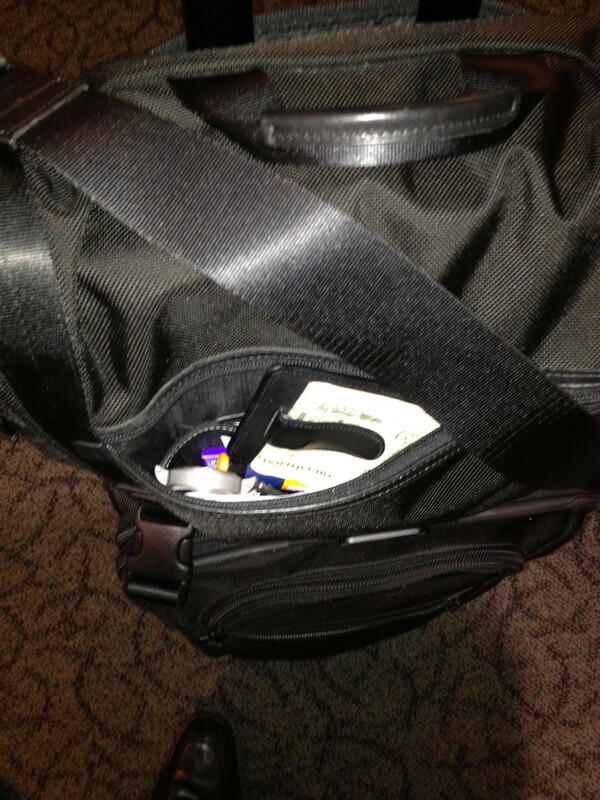 Liquids in the outer pocket and computer bag unlatched. A good security experience starts at home. Pick an exterior pocket that’s easy to access for your bag of liquids. 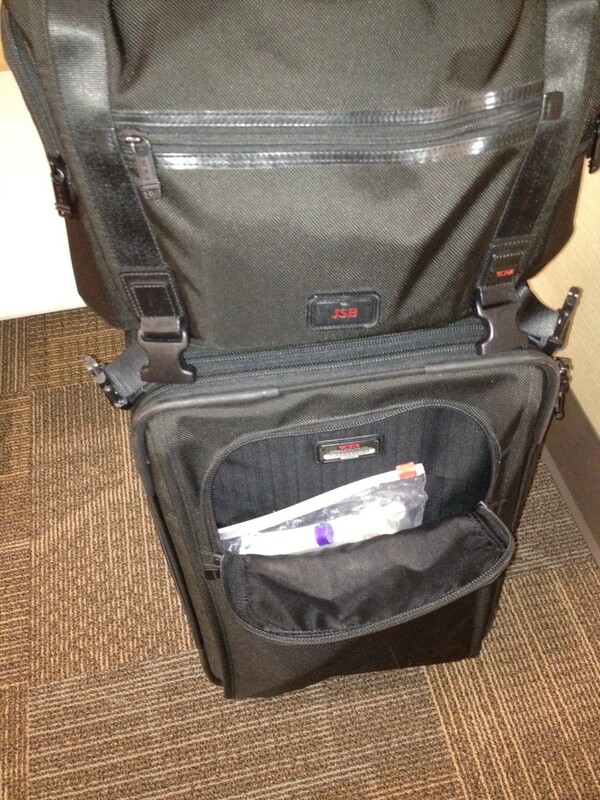 If you have a CPAP, put it at the outer-top of your packed items so it’s quick to grab. No computer bag? Put your laptop in a quick access area so it’s easy to get out. Why stop at the counter when you can walk straight to the screening checkpoint? No printer at home? Use one of the kiosks to print out your boarding pass and avoid the lines at the counter. I’m not one of those people who insists on slip-on shoes and belt-less travel. Just be practical. Find a belt that doesn’t set off metal detectors and don’t wear knee-high combat boots. My dress shoes are lace-up, but when tied loosely, they slip on and off easily. Watch, phone, wallet, & insulin pen all sit in my computer bag well before I get to security. I consistently see people forget to remove their watch, rings, etc. before they walk through the metal detector. Even those that do remember are usually fumbling with their phone, wallet, keys, etc. at the last minute. There’s no reason to use those little round bins. You should have a coat, bag or purse with you, so stick your personal items in it well before you get in line. I do it as I’m headed up the escalator to the screening area. Your items will be screened by the X-ray, just like normal as they go through inside your coat or bag. Just remember to keep your boarding pass and ID out. Since neither set off the metal detector, you can put them in your pocket after the agent checks off on them. Don’t lock yourself out and cause a delay. Get the pockets you need access to unzipped and unbuckled as soon as you get in line. It will be that much quicker to grab your liquids, computer, etc. Shoes don’t have to go in a bin, coats do. Does your laptop fit in a bin sideways? Pair it with your bag of liquids. I see too many people use 5+ bins when if they had planned better, they could have used 2-3 bins. Anything more than 3 bins is a lot to manage. This is a process that very few travelers practice. During my travel today, I put my shoes on the conveyor first, laptop (in a bin) second, my laptop bag third, liquids and coat (in a bin) fourth and carry-on last. It was easy to drop my shoes on the floor and slip them on as I transitioned my laptop into the laptop bag behind it, then my liquids into the open outer pocket on my carry-on. Finally, I grabbed my coat and headed to my gate. It was so fast that I walked by two people in front of me in line. This isn’t rocket science, but it is a system that makes your experience through the screening process quicker and less stressful. Do a little planning and prep, then stand back and enjoy watching the chaos of others. This entry was posted in Guides, TSA Security Screening and tagged checkpoint, easy, fast, Security, shortcut, tsa. Bookmark the permalink. this is AWESOME advice. thank you, travel ninja! I’m not slowing down the line, TSA is slowing down the line. Any helpful advice for a mom traveling with 3 boys (10, 8 & OMG 2), the older ones are great help but the younger one, OY! You’re in a tough spot on that one. At least they don’t have to remove their shoes, but that’s not much consolation. I think the best advice is still to be prepared ahead of time. Have them carry backpacks, and put their games, toys, coats, etc. in those packs prior to getting into the security line. Be sure you’re items are well organized, because you’ll probably be the one to slow things down. You’re distracted by them (rightfully so) and the kids probably don’t have a liquids bag, laptop, boots, a CPAP, stuff in their pockets, etc. If you can get your items in easy order and have their stuff in backpacks, it should minimize the delay. Thank you, luckily my older boys are very helpful.